Ataya Caffe is a unique Italian-African cafè, focused on vegan comfort food. Here you can taste Ravioli, italian soup and bruschetta, homemade hummus and the african bowl with Joloff rice, Mafè, Yassa and typical Senegalese vegetables. Ataya Caffe’s Italo-African cuisine couldn’t taste any better! 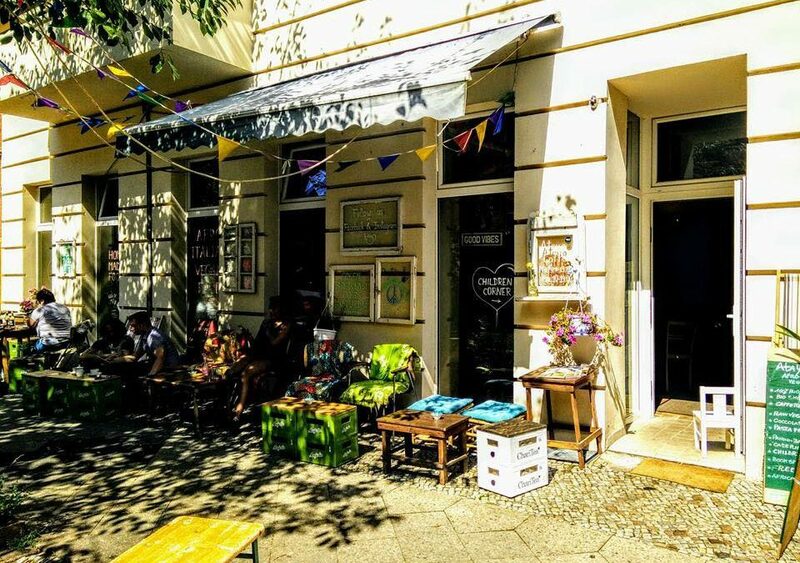 Right in the heart of Prenzlauer Berg you can find a very original café born from the love and passion for good food of Elisabetta and Bachir. Fresh made stuffed ravioli, minestrone soup and bruschetta, homemade hummus, the so-called “African bowl”, a cup filled with Joloff rice, mafè, yassa, and vegetables straight from Senegal: these are only some of the specialties of Ataya Caffe, the first (and probably only) Italo-African vegan restaurant in whole Germany. Together with the five above-mentioned specialties of the house, the lunch menu varies from backed ziti and lasagna layered with “pane carasau” (a traditional flatbread from Sardinia), to a great choice of soups, cous cous and pasta. You can also enjoy the vegan version of many of the recepies on the menu, even though some dishes are only available the vegetarian way because ravioli stuffed with Sardinan ricotta couldn’t possibly made be without their distinctive ingredient. For those willing to have breakfast at Ataya Caffe, the choice is also very broad. Here, you may enjoy delicious smoothies, as well as hot chocoloates “all’italiana”, croissants, cappuccinos, yougurts with cereals and everything else you would expect from a café that pays close attention to vegan organic food and to the quality of its ingredients. Where does the name Ataya come from? Ataya has a peculiar meaning – it’s the name given to the tea ceremony in Senegal. Bachir explains us, in flawless Italian “It can take place any time during the day and basically anywhere. At home or in the streets, people gather up for a ritual that can require up to 3 hours. The kettle has to be kept warm on a burner while the Chinese green tea infuses until it gets a very strong and bitter flavor. The ceremony is divided into three phases, in which the tea is poured into tiny glasses called “kas”. After that, the tea is poured from a glass to glass in order to obtain a thick foam. The higher the foam, the better the tea. Slowly, fresh mint leaves and sugar are added to it. Each phase has its own meaning. In fact, Ataya is a meeting, a reason to spend time together, a ritual in which kids take part too, patiently waiting for the third and mildest round. We thought that Ataya was the best word to represent us.” Not only the name, the Ataya Caffe also proposes the above-mentioned tea together with a rich buffet brunch, on the second Sunday of each month. An Afro-Italian vegan brunch, which definitely is a great way to try all of the delicacies of a very unique restaurant in Berlin.